The Club was formed in 1916 and was the first club to be created purely with the interests of the Labrador Retriever in mind. to encourage Field Trials and Shows, and to ensure qualified judges at both. A breed standard was drawn up, and although during the war years Field Trials and Shows were not actually taking place, plans were made for the running of these events and for the selection of suitable judges. From those early days the breed and the Club have gained in strength and popularity. Early records show that in 1912 there were 281 Labradors registered with The Kennel Club; ten years later that figure had risen to 916. In 2004, over 45,000 Labradors were registered, this being the highest number in all breeds. The club membership has also risen dramatically, with 2,300 members by the end of 2004, from a total of 51 Countries. 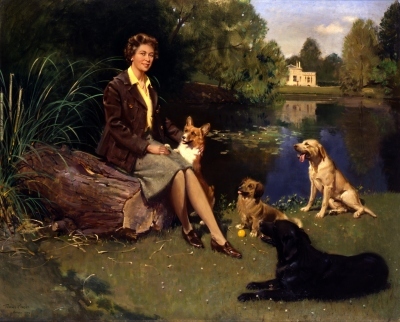 Since 1948 the Club has been honoured by Royal patronage; firstly HM King George VI, then, for the last fifty years HM Queen Elizabeth II has been an active member and Patron, regularly attending our Field Trials and hosting them at Sandringham and Windsor. Each year the Club holds a number of different events including Shows, Field Trials and training. These are held at different venues around the country. An illustrated year book is published, recording details of the previous year’s events, together with informative articles relating to the breed. The year book also contains many pages of kennel reviews and photographs. It is available free of charge to members and may be purchased separately by non-members. In this section of our website, you will find details of Members Champions, Working Champions and Field Trial Champions. There are details of the Banchory Bolo Cup and how to apply.